Celebrating 66 years of business in Oakland, La Borinqueña Mex-icatessen invites the public to a huge birthday fiesta from 10:00 a.m. to 2:00 p.m. on Sunday, June 27, 2010. The fiesta honors the legacy started in 1944 by family matriarch and business founder Mama Rosa Lopez. 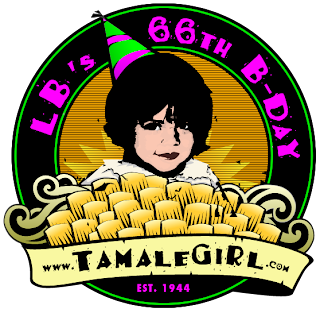 “It’s a party not only to celebrate our business but also our community,” says Tina “Tamale” Ramos, third generation owner. La Borinqueña’s fiesta coincides with the Oaklavía street festival which will transform downtown Oakland, through temporary traffic closures, into a recreation zone with car-free city streets. By enjoying these two events revelers will celebrate the spirit of comunidad y familia. Since opening its doors in 1944, La Borinqueña Mex-icatessen and its family owners have witnessed great changes including the transformation of this Old Oakland neighborhood. The one constant has been the restaurants wonderful customers, friendly staff and supportive neighbors. The fiesta will encourage everyone to come together to eat, drink, dance and enjoy each others company. Visit with Nati Ramos, Tina Tamale and special guests as well as live music by The Bomba y Plena Workshop from Noon to 1:30 p.m.
At 11:45 a.m., a special Proclamation presentation by Carletta Starks of Oakland Councilmember Nancy Nadel’s office will honor La Borinqueña Mex-icatessen and recognize the restaurant’s longevity and ongoing contributions to the Old Oakland neighborhood and Oakland. Special guest speakers will also take the microphone. Community information tables will add an informative element to the festivities. Learn more about the Oakland Grown movement supporting Independent businesses & artists. Meet the founders of 10,000 Steps Oakland who are developing the walking tour: “Walking the Invisible City.” Shop with Oakland jewelry artist Gabrielle Lessard of Mangosteen. Listen to an artist talk by Oakland-based Joaquin Alejandro Newman of Forrealism whose work is currently on display in the restaurant. Sports fans can purchase tickets for Old Oakland Neighbors Day at the Raiders on September 19, 2010, when the Silver and Black attack the St. Louis Rams and greet Raiderettes. Brunch items including chorizo and eggs, huevos rancheros as well as the full lunch menu with sangria and aguas frescas will be available for purchase during the event. For further information, contact Tina Tamale Ramos (510) 839-3854 or tina@tinatamale.com.